It’s the season for giving and here at RJE, giving back is in our blood. 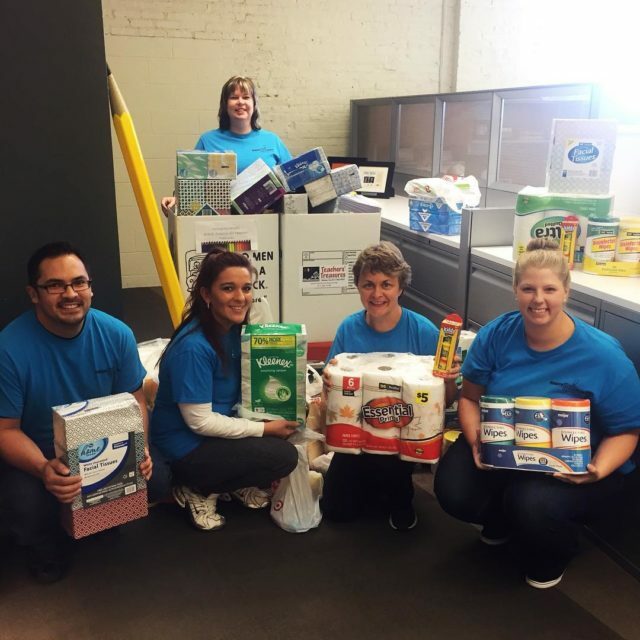 As much as we love to hug our clients, we love to hug our communities even more and we’re proud to say that we maintain a team of very charitable individuals both in and outside of work. To celebrate the work our team members have done for their communities in 2018, we are excited to share our annual philanthropy synopsis below. We’d like to extend a huge thank you to the RJE team members and our partners and friends across the Midwest working to improve our neighborhoods for everyone. RJE had another great year of Enterprise-wide support of United Way across our five markets. In addition to meeting our donation goal as a company, we had 100% participation for the 16th consecutive year. The RJE Indy team also won a UWCI Impact Award for our high participation numbers in United Way’s ReadUP program. Finally, our Kentucky team kick started their relationship with Metro United Way in Louisville by hosting a Reason for the Season event where community members, clients and vendor partners could assemble a healthy snack pack for families in need. The RJE Indy team prepares our donation for Teacher’s Treasures as part of Indy Do Day! Finally, our team members also supported more than a dozen faith-based organizations in 2018, as well as 10 different missions and homeless shelters! As the year comes to a close, we thank everyone for their contributions and volunteerism. We can’t wait to see what good deeds 2019 will bring!